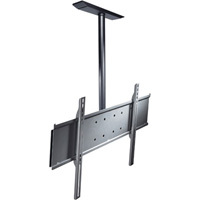 Universal mount for landscape mounting of 32" to 60" screens to various ceilings. Requires ceiling plate, sold separately. 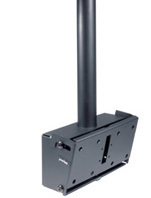 Universal mount for portrait or landscape mounting of 32" to 50" screens to various ceilings. Requires ceiling plate, sold separately. Universal mount for portrait or landscape mounting of 32" to 50" screens to wood joist on 16" centers or concrete ceiling. Dedicated mount for 32-65" screens to various ceilings. Requires screen-specific adapter and ceiling plate, both sold separately. 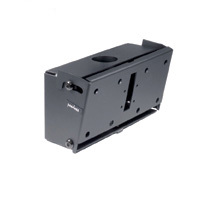 Dedicated mount for up 32-65" screens to wood joist on 16"
centers or concrete ceiling. Requires screen specific adapter, sold separately. The Straight Column Ceiling TV Mount offers a straight column from the ceiling attachment point to the flat panel LCD LED screen. The straight column ceiling mount is ideal for sports facilities, airports, lobbies or retail environments. It delivers 20° of adjustable tilt and 360° of swivel. This mount ships complete with 2.5’ fixed length extension column and theft resistant security fasteners. Model-specific or Universal style PLP adapter plates are available to match your screen make and model, both are sold separately. For screens larger than 60" a dedicated plate must be purchased.